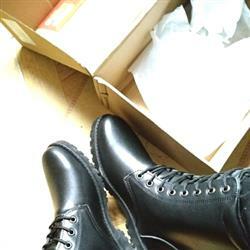 These boots are great! Perfect and true to size. Friends didn't know they weren't docs. They are softer leather than docs and i don't have to break them in. Very comfortable from day 1. I hope they hold up thru the winter and if they do i will most likely buy another pair. Hope it has more colours.